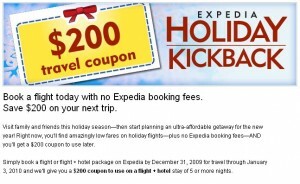 Book any roundtrip flight on Expedia.com by December 31, 2009 (for travel through January 3, 2010). 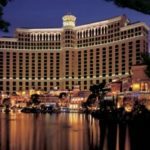 You’ll get a $200 off coupon to use on a flight/hotel combo of 5 nights or more. (for travel January 11 – March 30, 2010). The pre-discounted price has to be at least $1,000. How is this a good deal? It almost isn’t. 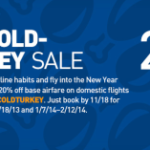 ;) But if you’re flying somewhere for the holidays and then plan on escaping the winter weather early next year, then it could be a deal!